Nissan cube Pros and Cons | Page 1 of 1 | Why Not This Car? What drives people to buy (or not buy) a certain car? TrueDelta's members share Nissan cube pros and cons based on their real-world driving experiences. GOOD PRICE. SCION NOT WILLING TO DEAL. BETTER FUEL MILEAGE THAN SCIONXB. RIDES AS GOOD AS XB.rnGETS A LOT OF LOOKS WHEN GOING DOWN ROAD.rn CUBE DRIVERS MOSTLY WAVE AT EACH OTHER IN PASSING. ALSO AT STOP LIGHTS TALK ABOUT THE CAR. Unparalleled rear seat room and comfort in this car for passengers. Should be among the easier cars of this size to put a baby seat into the back, if we have children. Our (longer and lower) 2004 Sentra paled in comparison of back seat usability. Small on the outside big on the inside. Looks like a kitchen appliance. The wave dashboard is very attractive, and puts the radio within easy reach. Climate controls too. With the exception of the lights and wipers stalks, the rest of the cabin ergonomics are a mixed bag...long reach to the sun visors and fuel door release. Awesome look, attracts attention everywhere you go. 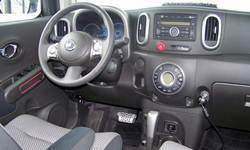 I found it to be very affordable with great standard equipment even in the base model. 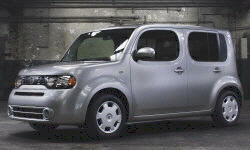 The Nissan Cube was affordable to moderately price. Being a full time student and working part time, I was looking for a cheap vehicle with low payments. I am a Nissan employee so, when buying new, looking at Nissans makes the most sense for me. I purchased the car for $15,200 (with some options and shipping). That is about half the cost of a Prius and less than other in-class cars. If the economy was better and my job more secure, I may have purchased the Prius. Unique styling, a step away from the conventional. Wrap around RR glass for improved visability. It very quiet, smooth, and comfortabe. The only time I ever notice any noise is when pressing down hard on the accelerator. The fan sound of the engine can get a bit louder than I am use to. Besides that, it is very peaceful, with no road noise, or bumps.